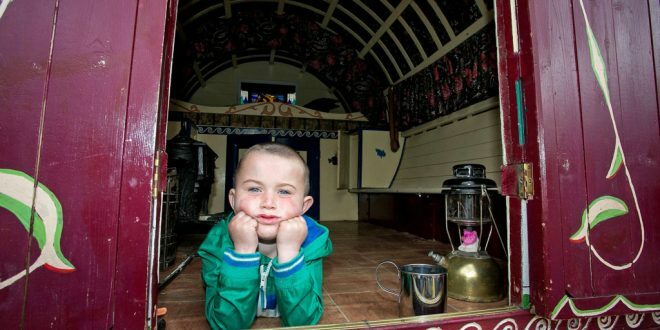 Three- year-old Michael Keenan in a replica caravan during a Traveller site re-enactment in Waterpark House Ennis. Photograph by Arthur Ellis. 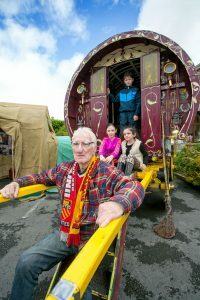 People young and old turned out for a very special exhibition of living history in Ennis recently. As part of Travellers Pride Week, Waterpark House was transformed into a scene of Traveller life from the 1950s. According to organisers, the event wasn’t just about showcasing times past, it was also about promoting positive mental health. Dr Siobhan O’Connor, co-ordinator Ennis CDP Primary Health Care Programme for Travellers in the Clare/Ennis CDP Education Peer Support Project explained, “From the Ennis CDP Primary Health Care Programme’s perspective it was a day invoking positive mental health. Travellers could position themselves as part of the history of Ennis, Clare and Ireland. There was a sense of belonging and ownership of the space and history of Ireland. This was particularly strong in the drama that was performed talking about the role of Travellers in the 1916 Rising, when Travellers transported messages and hardware between the volunteers at great risk. The CDP Primary Health Care Programme for Travellers in Clare, along with the Clare Traveller Strategy Interagency Group and Meath Traveller Workshop worked together on hosting the exhibition in Ennis. The scene included a fully restored barrel top wagon, a traditional tent, a flat cart, working tin-smith, story telling and, of course, a camp-fire. The exhibition was open to all members of the public to come along and witness and experience this element of Irish history. Nearly 200 people came along on the day for the chance to step back in time. 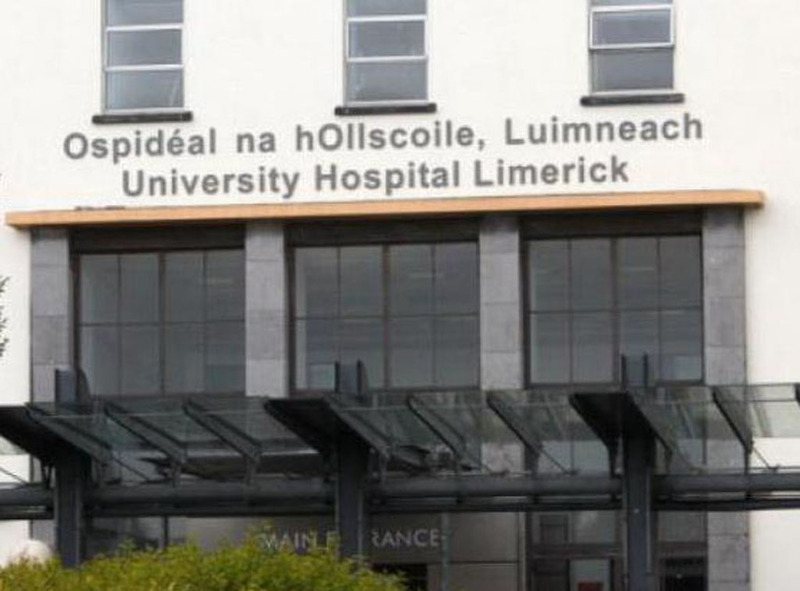 Dr O’Connor said, “We were absolutely delighted with the event. There were nearly 200 people, Traveller and non-Traveller, old and young, adult and child, who came along on the day. We were happy to welcome schoolchildren and teachers from local schools, young people and facilitators from the local youth groups and adult learners and trainers from the local training centres, as well as passers by. Edward McDonagh with 10-year-olds Diana and Brian McDonagh and eight- year-old Tracey Marie McDonagh at the Traveller site re-enactment. Photograph by Arthur Ellis. She added that, in relation to the Ennis CDP Education Peer Support Project, the event marked an “opportunity for the young people to engage with their history and culture and hopefully learn from it and add to the artefacts and research of their heritage”. The event highlighted “the uniqueness of the Traveller culture” and met one of the objectives of the Traveller Interagency Group, she explained. Among the group’s objectives is the promotion of community and inter-community activities in order to strengthen the Traveller cultural identity and sense of well-being by means of integrative activities, that can be shared by the Traveller and non-Traveller communities. The local Traveller interagency process was initiated on a country-wide basis by government in 2006. The policy was implemented through newly established TIGs in each local authority area including Clare, which include members from the statutory/state and community/voluntary sector, as well as representatives of the Traveller community.